A rare chance to enjoy nine classic musical films on the big screen. 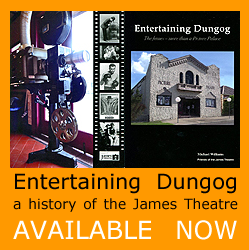 Spend the long weekend in Dungog, the authentic cattle and timber town which has Australia’s oldest continually operating cinema, the James Theatre. Spend two or three nights in the friendly Dungog Shire, with a wide range of accommodation, and try genuine country life. Come by train from Newcastle or Sydney with your Opal card; or catch the XPT; or drive yourself, three hours from Sydney, just over an hour from Newcastle. In partnership with Ticketmaster which is promoting the event state-wide, we’re showing the following 9 classic musical films. Tickets are available online at this link, Unsold tickets will be available at the door. Ticket prices are $15 Adult, $13 Seniors and concession, $10 children. Our 2018 Dungog Festival opens with a bang, with a screening of the opulent and glitzy Moulin Rouge!, unarguably the lushest of writer-director Baz Luhrmann’s famous red curtain trilogy. Luhrmann’s one-of-a kind, grandiose style of filmmaking was never more loved by critics and audiences than with this 2001 hit. A celebration of love and creative inspiration takes place in the infamous, gaudy and glamorous Parisian nightclub, at the cusp of the 20th century. Christian, a young poet (Ewan McGregor) is plunged into the heady world of the Moulin Rouge, and begins a passionate but doomed affair with the club’s most notorious and beautiful star, Satine (Nicole Kidman). Also starring John Leguizamo, Jim Broadbent, Richard Roxburgh, and Garry McDonald. Amadeus is a 1984 American drama directed by Miloš Forman, adapted by Peter Shaffer from his stage play Amadeus. Set in Vienna during the latter half of the 18th century, it is a fictionalised telling of the life, success and troubles of Wolfgang Amadeus Mozart, as told by Antonio Salieri, the contemporary composer who was insanely jealous of Mozart’s talent and claimed to have murdered him. Amadeus won eight Academy Awards, including Best Picture and Best Actor. The soundtrack album reached #1 in the Billboard Classical Albums Chart, sold over 6.5 million copies and received thirteen gold discs, making it one of the most popular classical music recordings of all time. It won the Grammy Award for Best Classical Album in 1984. In this much anticipated sequel to the worldwide sensation Mamma Mia!, Sophie learns about her mother’s past while pregnant. Ol Paker (The Best Exotic Marigold Hotel) has written and directed this musical sequel. Mamma Mia! Here We Go Again travels back in time, visiting Donna’s (played by Meryl Streep and Lily James) young life and showing the fun she had with the three possible Dads of Sophie (played by Amanda Seyfriend). Sophie is now pregnant and, like Donna, she will be a young mother. She realises, with laughter and music along the way, that she will need to take risks just as her mother did. Original cast members Meryl Streep, Amanda Seyfried, Colin Firth, Pierce Brosnan, Stellan Skarsgård, Julie Walters, Dominic Coooper and Christine Baranski all return, and Cher makes a grand appearance. Directed by Jim Sharman, this low-budget freak show/cult classic/cultural institution concerns the misadventures of sweethearts Brad (Barry Bostwick) and Janet (Susan Sarandon) inside a strange mansion that they come across on a rainy night. Stuck with a flat tyre during a storm, the young couple discover the eerie mansion of Dr. Frank-N-Furter (Tim Curry), a transvestite scientist. As their innocence is lost, Brad and Janet meet a houseful of wild characters, including a rocking biker (Meat Loaf) and a creepy butler (Richard O’Brien). Through elaborate dances and rock songs, Frank-N-Furter unveils his latest creation: a muscular man named “Rocky.” The Rocky Horror Picture Show didn’t invent late night screenings but instead turned an off Broadway musical into an art form that became a phenomenon within itself. Two decades after its unlikely revival, Lucy Walker’s doco bids goodbye to the Cuban all-star group. The musicians of the Buena Vista Social Club exposed the world to Cuba’s vibrant culture with their landmark 1997 album. Now, against the backdrop of Cuba’s captivating musical history, hear the band’s story as they reflect on their remarkable careers and the extraordinary circumstances that brought them together. Now it’s finally time to revisit with the remaining original members of the Buena Vista Social Club and explore their contribution to the unknown history of Cuba. A Valentine for All the Young Lovers of the World The angelically beautiful Catherine Deneuve was launched to stardom by this dazzling musical heart-tugger from Jacques Demy. She plays an umbrella-shop owner’s delicate daughter, glowing with first love for a handsome garage mechanic, played by Nino Castelnuovo. When the boy is shipped off to fight in Algeria, the two lovers must grow up quickly. Exquisitely designed in a kaleidoscope of colours, and told entirely through lilting songs by the great composer Michel Legrand, The Umbrellas of Cherbourg is one of the most revered and unorthodox movie musicals of all time. Expanding on their Saturday Night Live characters, John Belushi and Dan Aykroyd star as Jake and Elwood Blues, two white boys with black soul. Sporting cool shades and look-alike suits, Jake and Elwood are dispatched on a “mission from God” by their former teacher, Sister Mary Stigmata (Kathleen Freeman). Said mission is to raise $5000 to save an orphanage. In the course of their zany adventures, the Blues Brothers run afoul of neo-Nazi Henry Gibson, perform the theme from Rawhide before the most unruly bar crowd in cinema history, and lay waste to hundreds of cars on the streets and freeways of Chicago. In case you aren’t swept up in the infectious nuttiness of the brothers Blue, you might have fun spotting the film’s legion of guest stars, including James Brown, Cab Calloway, Aretha Franklin, Ray Charles, John Candy, Carrie Fisher, Steve Lawrence, Twiggy, Paul Reubens (Pee-Wee Herman), Frank Oz, and Steven Spielberg. English National Opera’s ENO Screen is a unique cinematic experience that’s delighted audiences of all ages and brought sensational opera productions to the big screen. For the first time ever ENO is available for Australian screens, and we’re delighted to bring two performances of their popular operas to the Dungog Festival. ENO Performances are captured live in the London Coliseum and are shot on multi-cam in stunning cinematic HD. ENO’s prestigious operas are all performed in the English language. The Barber of Seville the beloved comic opera by Rossini, will have you smiling from the moment it begins. When grumpy Bartolo stands between his beautiful young ward Rosina and her lover Count Almaviva, there’s only one person to call on: local barber and man-with-a-plan Figaro. But with Rosina kept under lock and key, can Figaro fix it for them? It could be a close shave. Set in an elegant vision of 18th-century Seville, Jonathan Miller’s much-loved production is as side-splittingly funny as ever. For this revival, the talented Christopher Allen will conduct Rossini’s sparkling score, packed full of wit and playful tunes. A superb cast includes ENO favourite Andrew Shore (The Pirates of Penzance, The Mastersingers of Nuremberg) in one of his signature roles as Dr Bartolo, former ENO Harewood Artist Kathryn Rudge as Rosina, and rising baritone Morgan Pearse as the barber Figaro. The Mikado is probably Gilbert and Sullivan’s most popular opera. Nanki-Poo loves Yum-Yum. Just one snag. She’s betrothed to Ko-Ko, the new Lord High Executioner. And Ko-Ko needs to find someone to execute – chop chop! Otherwise, it’s his own neck on the block. Maybe Ko-Ko and Nanki-Poo can come to some arrangement… without anyone losing their head? Set in an ever-so English 1930s seaside hotel, Jonathan Miller’s Marx Brothers-inspired song-and-dance Mikado is a popular hit with audiences of all ages. The combination of Gilbert’s virtuosic wit, Sullivan’s memorable melodies and Miller’s hilarious antics is irresistible. Distinguished bass Robert Lloyd sings the genial Mikado for the first time, 46 years after making his ENO debut, while Richard Suart, the acknowledged master of the Lord High Executioner’s pathological ‘little list’, returns as Ko-Ko. ENO Harewood Artists Mary Bevan and Anthony Gregory play the lovers Yum-Yum and Nanki-Poo, while ENO Mackerras Conducting Fellow Fergus Macleod makes his company debut.